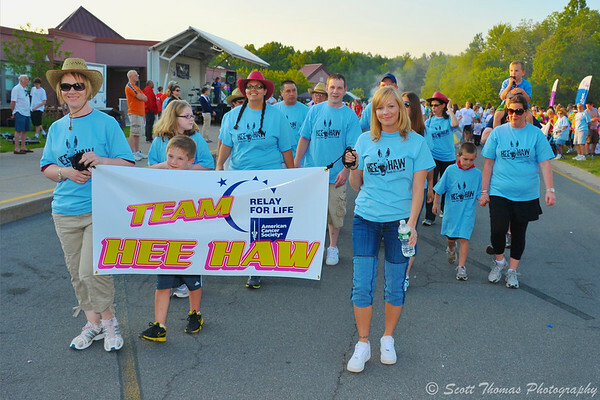 Members of Team HeeHaw walk the Banner Lap during the Baldwinsville (NY) Relay for Life. Meet Team HeeHaw who came in Number 1 with over $5,300 in donations for the Baldwinsville Relay for Life event held last week. All money raised goes directly to the American Cancer Society for research into finding a cure for all cancers. Thanks to all of them and to all of you for your support. We will be back next year to defend our crown! This entry was posted in Event, People and tagged american cancer society, baldwinsville, donations, family, friends, fundraiser, new york, relay for life, team heehaw. Bookmark the permalink. Thank you, Nye! The whole 12 hour overnight walk was cool and dry. Perfect weather. Bravo to the Hee Haw Team ! They did a wonderful job for a cause that really needs support. Thanks Scott for your own support and images. It is so wonderful that you were involved in such a worthy cause, Scott. Bowing deeply to you and Team Hee Haw.